Note: Access to the catalogue is restricted to on-campus computers. The library is an integral part of Ashesi University. Its purpose is to support Ashesi's mission of nurturing excellence in scholarship, leadership and citizenship. 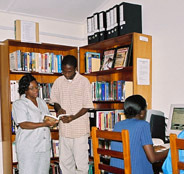 For information about how to support the library, see the Ashesi Book Brigade web page. The library is an integral part of Ashesi University. Its purpose is to support Ashesi's mission of nurturing excellence in scholarship, leadership and citizenship. Ashesi's library collection currently consists of over 3,000 books and 200 CD-ROMs focused on three main areas: business administration, computer science, and the liberal arts component of our curriculum, including titles related to literature, literary criticism, social theory, philosophy, history and political science. The collection will continue to grow over time. Local Publications: A collection of publications from various institutions and organizations such as the Government Ministries, Bank of Ghana, Centre for Democratic Development (CDD), Institute of Economic Affairs (IEA), National Council for Tertiary Education (NCTE), etc. are available. Library Staff: The library is managed by Perpetua Dadzie, an experienced librarian who has worked in school libraries in Jamaica, Honduras, Togo and Ghana. As part of the work study programme, select students are given the chance to work in the library in the evenings and on Saturdays. They shelve books, assist other students in locating materials, and help with data entry.